Here’s the last bit of the end of the year playlists, I’m sure I missed some key players but getting all 60 tracks together felt great. I’d love to see your lists, feel free to post them in the comment section. 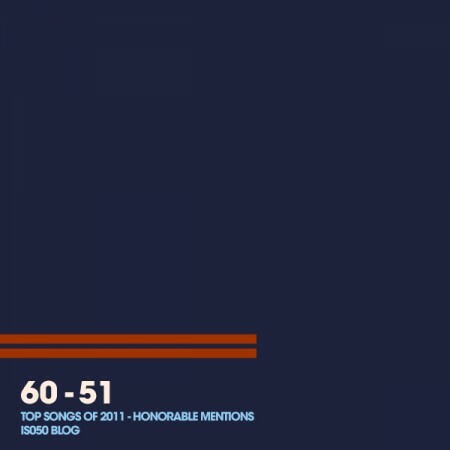 TOP Songs of 2010 ̵.. Top 50 Songs of 2011: #.. Top Albums of 2008 R..
Nicolas Jaar’s “Space is only noise that you can see” has become one of my favourite albums of the year. For sure some of his songs deserve being on the top of my list. Can somebody tell me what font is used in the preview picture? I am now satisfied with the validity of this list ;) Shelly’s version of “Cub” is resounding and intense; in fact, I had expected to see Shelly’s remix of D.R.U.G.S. “love lust” on the list, too. The blog has put out so many good things in the last week. Many thanks for the effort! What, nothing by Grimes, Terror Train or D’eon?!?! One non-musician’s opinion but as good as “pressure” is, “escape” is the one that rings the bell for me – did you check that one out? ?